MBDA presented NCES (Network-Centric Engagement Solutions), a new network-centric ground based air defense architecture based on the latest real-time data exchange protocols. Currently undergoing integration tests with a view to delivery to a military customer in the near future, NCES breaks with previous air defense organizations. 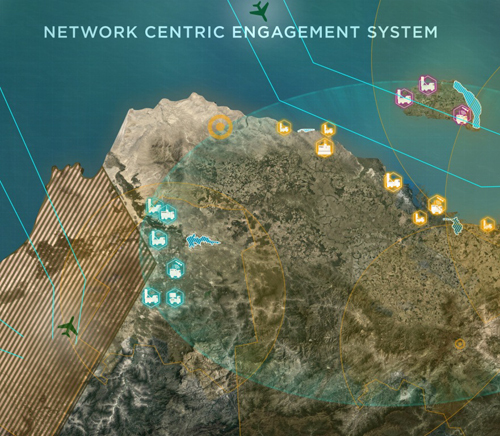 “In this approach, sensor resources are networked to develop the best air traffic situation, while ground-to-air resources – whether very short-, short-, or medium-range firing units; or ground-to-air coordination and engagement centers – are also networked to obtain a more effective defense solution,” explained Franck Seuzaret, Head of Battlefield and Air Defense Systems. “These architectures can be implemented at local level and all the way through to national territory defense. MBDA can provide all the capabilities, sensors, means of communication, coordination centers, firing units, and can also set up a means of engagement architecture to interface with a pre-existing defense structure,” he added. Compared to conventional air defense architectures - which are very hierarchical - networking different resources delivers considerable operational flexibility and very high resilience. With NCES, the organization of ground based air defense ceases to be constrained by the notion of a battery structured around an organic radar and C2 system. The effectors or launcher systems are acquired by the engagement network immediately on being connected. Similarly, the sensors enhance the air traffic situation as each is added to the network. If a command & control center is lost, the missile and sensor equipment attached to it are dynamically taken on board by another command & control center via the network, with no loss of firepower. This makes the NCES architecture suitable for a wide diversity of organizations, from mobile batteries up to territorial defense systems. It can also easily integrate existing ground-based air defense systems, by means of a gateway converting the data normally exchanged by the battery with the ground-to-air defense tiers above or below it. “MBDA is a global leader in ground based air defense, a sector in which the group has sold over 4,000 missiles and 500 firing units to 23 clients across the world since the company was created in 2001. MBDA has a diversified offer for each layer of ground based air defense, from very short range to extended air defense systems. The thorough knowledge acquired over all this time of the different organizational choices of the armed forces, and of the technologies implemented to ensure interception has allowed MBDA to develop for NCES a sustainable architecture capable of integrating future systems and technologies,” said Antoine Bouvier, CEO of MBDA.